（英文） Beesly, Patrick. Room 40: British Naval Intelligence, 1914–1918. Oxford: Oxford University Press. 1984. ISBN 0-19-281468-0. （英文） Bennett, Geoffrey. 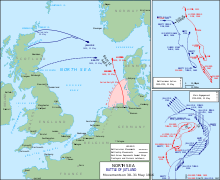 The Battle of Jutland. London: Pen and Sword Military Classics. 2006. ISBN 1-84415-300-2. （英文） Campbell, John. Jutland: An Analysis of the Fighting. London: Conway Maritime Press. 1998. ISBN 1-55821-759-2. （英文） Gardiner, Robert; Chesneau, Roger. Conway's All the World's Fighting Ships, 1922–1946. Annapolis, MD: Naval Institute Press. 1980. ISBN 0-87021-913-8. （英文） Gardiner, Robert; Gray, Randal. Conway's All the World's Fighting Ships: 1906–1922. Annapolis, MD: Naval Institute Press. 1984. ISBN 0-87021-907-3. 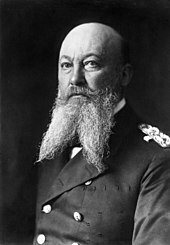 （英文） Gröner, Erich. German Warships: 1815–1945. Annapolis, MD: Naval Institute Press. 1990. ISBN 0-87021-790-9. （英文） Halpern, Paul G. A Naval History of World War I. Annapolis, MD: Naval Institute Press. 1995. ISBN 1-55750-352-4. （英文） Herwig, Holger. "Luxury" Fleet: The Imperial German Navy 1888–1918. Amherst, NY: Humanity Books. 1980. ISBN 978-1-57392-286-9. （英文） Heyman, Neil M. World War I. Westport, CT: Greenwood Publishing Group. 1997. ISBN 0-313-29880-7. （英文） Lambert, Nicholas. Planning Armageddon. Cambridge, MA: Harvard University Press. 2012. ISBN 978-0-67406-149-1. （英文） Massie, Robert K. Castles of Steel: Britain, Germany, and the Winning of the Great War at Sea. Random House. 2003. ISBN 0-345-40878-0. （英文） New Apparatus for Coaling Warships. Industrial Magazine (Collingwood, OH: The Browning Press). 1907, 6 (1): 65–66. （英文） Padfield, Peter. 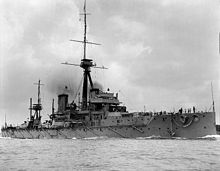 The Great Naval Race: Anglo-German Naval Rivalry 1900–1914. Edinburg: Birlinn. 2005. ISBN 978-1-84341-013-3. （英文） Sondhaus, Lawrence. Naval Warfare, 1815–1914. London: Routledge. 2001. ISBN 978-0-415-21478-0. （英文） Staff, Gary. 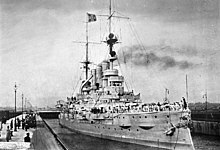 German Battlecruisers: 1914–1918. Oxford: Osprey Books. 2006. ISBN 1-84603-009-9. （英文） Staff, Gary. German Battleships: 1914–1918 (Volume 1). Oxford: Osprey Books. 2010. ISBN 978-1-84603-467-1. （英文） Staff, Gary. German Battleships: 1914–1918 (Volume 2). Oxford: Osprey Books. 2010. ISBN 978-1-84603-468-8. （英文） Sweetman, Jack. The Great Admirals: Command at Sea, 1587–1945. Annapolis, MD: Naval Institute Press. 1997. ISBN 978-0-87021-229-1. 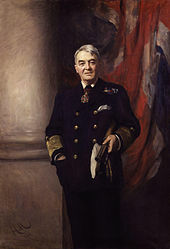 （英文） Tarrant, V. E. Jutland: The German Perspective. London: Cassell Military Paperbacks. 1995. ISBN 0-304-35848-7. （英文） van der Vat, Dan. The Grand Scuttle. Worcester: Billing & Sons Ltd. 1986. ISBN 0-86228-099-0. （英文） Woodward, David. The Collapse of Power: Mutiny in the High Seas Fleet. London: Arthur Barker Ltd. 1973. ISBN 0-213-16431-0.